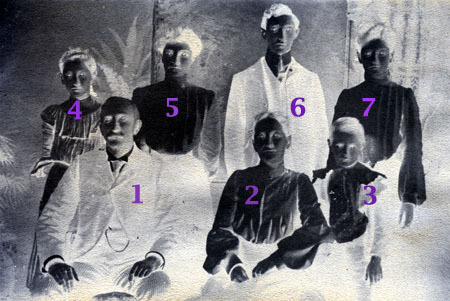 Family of Charles Bascom Harris, Sr.
Name: Family of Charles Bascom Harris, Sr.
Charles B. Harris, Sr., was the youngest son of Miletus B. Harris (1810-1880) and Frances Caroline (Grubbs) Harris (1810-1877). Miletus Harris settled in Scottsville in 1837 and prospered as a merchant. Charles and his brother, Henry, worked for their dad and later inherited the 'Harris Merchandise' operation on Main Street. During the 1870's, Helen Goddin Crafton from Richmond often visited her Worsham cousins in Scottsville, who were the Harris family's neighbors. A romance developed between Helen and Charles, and they were married on December 1, 1879, in the Old Monumental Church in Richmond. They returned to Scottsville via a James River packet boat and lived with Charles' father, Miletus Harris, who was by then a widower. Miletus died shortly thereafter, and Charles and Helen continued to live in the Harris house next to the Baptist Church on Harrison Street with bachelor brother, Henry. To accommodate his growing family in 1882, Charles purchased 40 acres of land overlooking Scottsville and, with the help of Henry, built a large home on it which they called 'Fairview.' 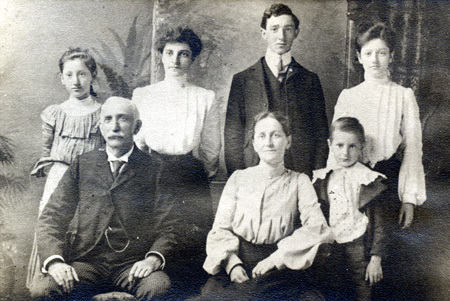 Uncle Henry, referred to as 'Nunk' by his nieces and nephews, became Social Chairman at Fairview, and his artistic and musical talents were enjoyed by and influenced the six Harris children. 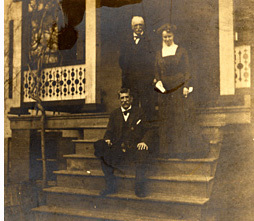 The 1911 photo at right shows Henry seated on the front steps of Fairview with Charles and an unidentified lady standing behind him. In 1920, Charles and Helen Harris gave up Fairview as the house was quite large, their children were gone, Henry was deceased, and business activity was ebbing. They lived with their daughter, Annie 'Parke' Smith and her husband, Will, in their home on Valley Street that is now Thacker Brothers Funeral Home. After her husband, Charles, died in 1930, Helen (Crafton) Harris moved to Charlottesville where she lived with her daughter, Helen McFarland, until death at age 98. For more information and photographs of this family, see the 1928 Burgess photo of Helen and Charles Bascom Harris, Sr. in the Portraits section of this history. These two photos are part of the Katherine Ellis collection. Katherine resides in Scottsville and is the granddaughter of Charles Bascom Harris, Sr., and Helen (Crafton) Harris.